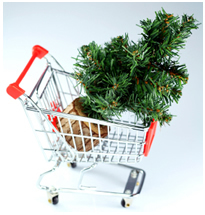 The holiday season is in full swing Were you one of those out there at midnight shopping on Black Friday? It’s easy to spend money during the holidays We shop to make the holidays special for those we love and also to look good and feel good during the darkest month of the year. If you’re worried about spending too much, think about these things before you shop. Do you really need the item? If not, don’t buy it. Can you (or the person you are giving this to) live without it? Do you have the cash to pay for the item? You don’t want to charge items that you can’t afford to pay off when the bill arrives. Is this a good price? Do your research ahead of time to know that you can buy it for less. This year with the economy we are in, I would suggest that you do some planning before you tackle the holiday season First look at your list are there people that you can eliminate buying a gift for? Maybe you could spend time with that person creating new memories instead of buying an item off the shelf For the people on your list that you will be buying for, think long and hard to determine what amount of money you have to spend This should be an amount within your budget (not on credit cards that must be paid off later) Your holiday budget should include all the items you have to buy, such as hostess and/or food gifts for parties, tips for the service people in your life, additional gas and holiday clothing for yourself. If you’re going to buy something (especially during the holiday season), do it wisely and within your budget Let the joy of the holidays extend in January by avoiding the stress of January credit card bills Remember, a bargain isn’t a bargain if you’re buying something you don’t need.